36 mm 18K rose gold case, 10.05 mm thick, sapphire-crystal back, bezel set with 160 diamonds (~0.77 ct), brown sunburst dial with gold applied numerals and luminescent hour markers, caliber 324 S C self-winding movement with date in an aperture and center sweep second hand, approximately 35-45 hours of power reserve, 18K rose gold bracelet, fold-over buckle. Water resistant to 30 m.
36 mm 18K rose gold case, 10.05 mm thick, sapphire-crystal back, bezel set with 160 diamonds (~0.77 ct), silvery dial with a shimmering vertical and horizontal satin finish, gold applied numerals and luminescent hour markers, caliber 324 S C self-winding movement with date in an aperture and center sweep second hand, approximately 35-45 hours of power reserve, 18K rose gold bracelet, fold-over buckle. 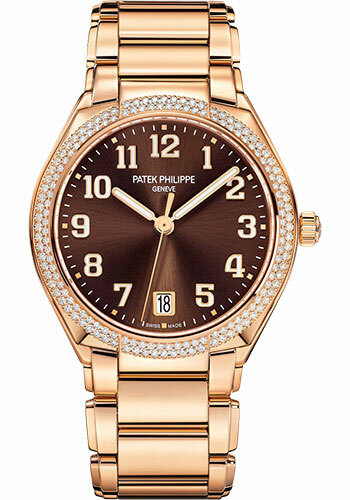 Water resistant to 30 m.
36 mm 18K rose gold case, 10.05 mm thick, sapphire-crystal back, crown set with 13 diamonds (~0.06 ct), bezel and lugs set with 208 diamonds (~1.01 ct), silvery dial with a shimmering vertical and horizontal satin finish, gold applied numerals and luminescent hour markers, caliber 324 S C self-winding movement with date in an aperture and center sweep second hand, approximately 35-45 hours of power reserve, 18K rose gold bracelet set with 248 diamonds (~0.81 ct), fold-over buckle. Water resistant to 30 m.